Interferential Electro-Therapy is a therapeutic treatment to aid in the relief of pain and the promotion of soft tissue healing. Tiny amounts of electrical impulses are induced into the tissues in the vicinity of the injury. Where these waves intersect below the surface of the skin, a low-frequency stimulation is created. This prompts the body to secrete endorphins and other natural pain killers to help relieve pain. 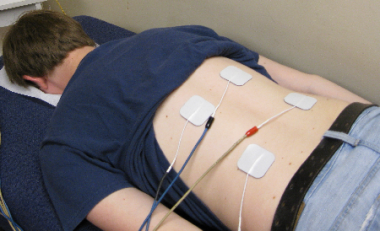 Most patients find Interferential Electro-Therapy to be extremely beneficial, and describe the treatment as a faint “pins and needles” sensation. It is most often used for pain relief and to aid in reducing the swelling of soft tissues. Ligament sprains, muscle strains and spasms often respond to this treatment, helping to reduce atrophy and increase blood circulation. Patient benefits include: reduces painful symptoms, decreases local swelling, promotes muscle tone, restores normal movements, releases the body's natural pain killers, and accelerates the healing process.